Aphids are a major pest of greenhouse crops including sweet peppers, cucumbers, and many ornamental species. The most problematic species have a wide host range and can infest a variety of crops in both vegetable and ornamental greenhouses. Proper species identification; most aphid parasitoids are species specific. Aphids are tiny, soft-bodied insects with long legs and characteristic cornicles at the rear end of their oval-shaped body. Depending on the species, they are about 1–2 mm in length when fully developed. Generally, aphids are wingless but under high density conditions, or when aphids are dispersing, winged aphids (“alates”) can be observed. Aphids are often found in colonies of at least one adult female and her offspring, lining a plant stem or growing point or on the underside of leaves. Immature aphids are essentially smaller versions of adult aphids. Adults vary in colour, not only among species but also within species, from different shades of green through to yellow, pink-red or brown and black. 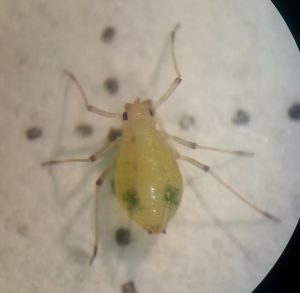 Identification of the most commonly found aphid species in greenhouse crops can be done with a hand lens, but observation of some features is only possible under high magnification. 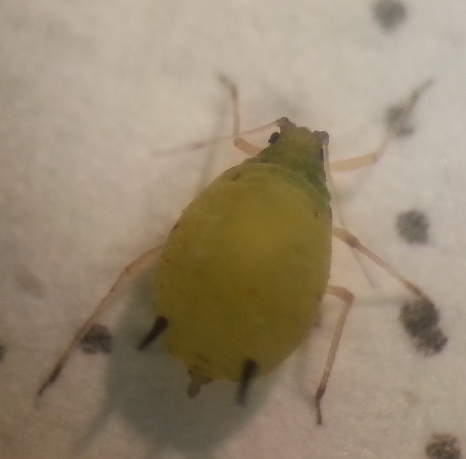 Identification of the aphid species is very important to determine the best control option. Since different colour morphs exist within species, colour is typically not a good diagnostic characteristic. If you have found an aphid that is not described as above, speak with an IPM extension specialist to have it identified. Long legs, antennae as long as body or longer, dark green spots at base of cornicles, dark bands at joints of legs and antennae. Green. 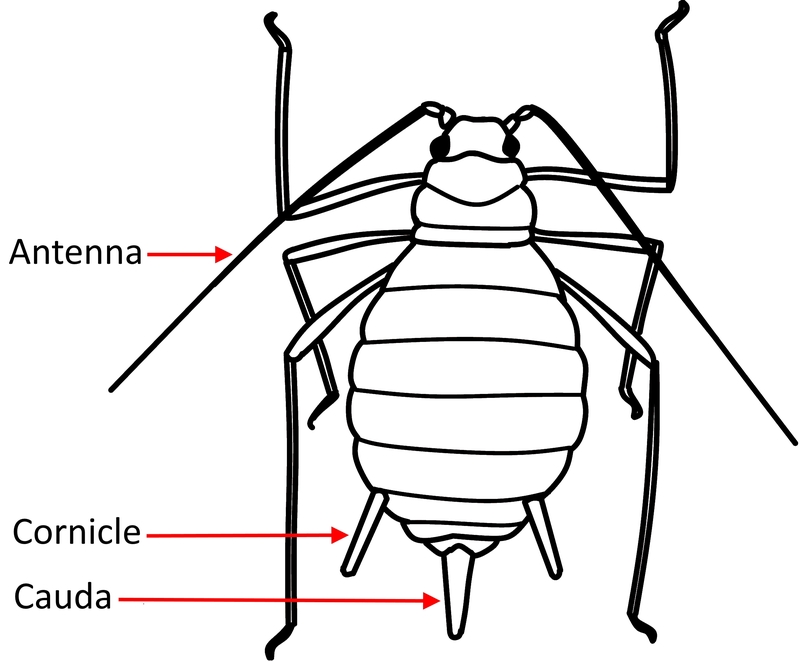 Long legs, antennae as long as body or longer, elongated body, long cauda and cornicles. Green or pink. Dark aphid, colonies typically lining chrysanthemum stems, Chrysanthemum only known NA host, adults 1.5mm long, cornicles black, adults dark brown to black, nymphs dull brick-red. Looks like green peach aphid but with dark bands at joints of legs and antennae. Green, orange or pink, adults may have black marks on abdomen. Cornicles pale with dark tips, as long as or longer than cauda. This is the aphid species commonly used on banker plants. It is found only on monocots such as grasses. Antennae as long as body or a bit shorter, adults frequently have an orange or brown patch around the base of the cornicles. Colour is orange green to dark olive green. In greenhouses, all aphids are female and reproduce asexually, giving birth to live female clones. In fact, newly laid females already have embryos developing inside them, which explains how aphid populations can increase so fast. Outside, where environmental conditions fluctuate with the seasons, aphids go through a sexual reproductive cycle which includes the production of males and eggs in fall. The black shiny oblong eggs are rarely observed in greenhouses. The time it will take an aphid to complete a life cycle depends on temperature and host plant. At typical greenhouse temperatures, development from nymph to adult is completed in 7-10 days. There are 4 immature stages, also called nymphs, which essentially look like smaller versions of adults. One female can produce 60-100 nymphs over a 20-day period. There are differences in the biology of aphids depending on the species, the host plant on which the aphid is living and environmental factors (especially temperature). Winged aphids are produced when colonies reach a certain population density, which will disperse to other plants. When aphids are disturbed, for example by a predator, they produce an alarm pheromone. This stimulates the aphids to walk away or even drop from the plant. Some aphid species (e.g. foxglove aphids) are more easily disturbed than others. Aphids cause little direct feeding damage. They insert their piercing-sucking mouthparts into the phloem of the plant, feeding on plant sap, which may reduce plant vigour. 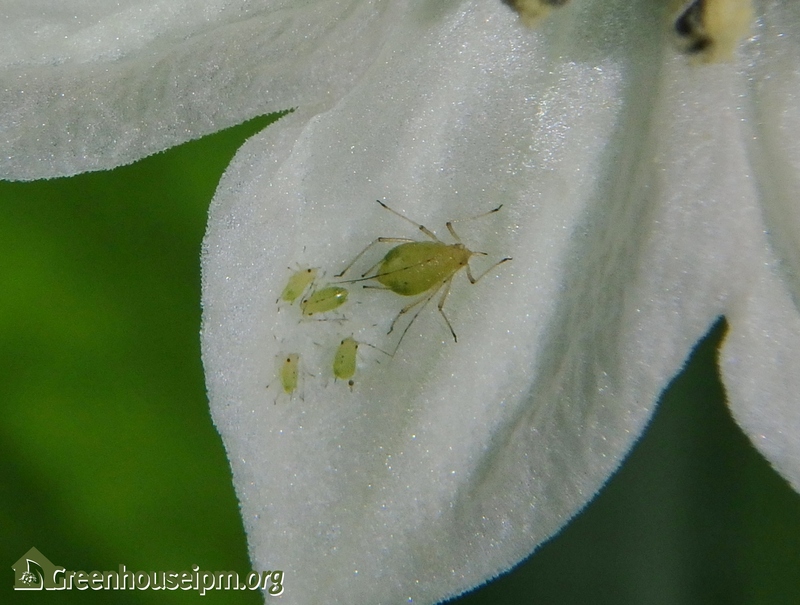 Foxglove aphids often cause stunting of expanding leaf tissue due to their toxic saliva. As aphids are phloem feeders, they excrete copious amounts of a sugary substance called honeydew. This honeydew promotes the growth of a black sooty mould fungus on plant surfaces, thereby reducing crop quality. The sooty mould itself does not damage the plants although in large quantities it can reduce the photosynthetic capacity of the plant. 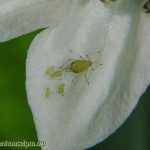 In ornamental crops, there is a very low threshold for aphids; their visible presence on its own and the white cast skins (“exuvia”) left on the leaf surface by moulting nymphs detract from the appearance and quality of the crop. water-melon mosaic virus (WMV), zucchini yellow mosaic virus (ZYMV), papaya ringspot virus (PRSV), and tobacco etch virus (TEV). Aphid populations can explode quickly, so frequent scouting and early detection is key to successful control. Inspect the crop regularly, checking the undersides of leaves and plant stems. Look for the aphids themselves as well as cast skins, honeydew, and stunted plant growth. Aphids often prefer young foliage. In hot weather, some aphids, like foxglove aphids, will collect under leaves at the soil surface, making them easy to overlook. Only winged aphids can be found on yellow sticky cards. Although you may catch some while they are dispersing, this is not a good indicator of infestation levels in the crop. Take note of preferred plant varieties; this information can be used in the future to concentrate more scouting effort and preventative releases of bios where they are most likely to appear first. Inspect all incoming plant material for aphids and other pests. Maintain good weed control both inside and outside the greenhouse. Avoid over-fertilizing the crop; high nitrogen levels in plant material may encourage aphid population growth. Keep ants under control. Although ants themselves may not be a pest, they can undermine your aphid biocontrol program. Ants feed on the honeydew that aphids excrete, and they will protect their “flock” of aphids from attacking predators and parasitoids. Screen vents to prevent winged aphids from flying into your greenhouse from the surrounding area. If vents are not screened, setting up a large number of sticky cards or tape near vents and other entry points can catch dispersing winged aphids as they enter the greenhouse, as well as many other flying pests such as thrips and whiteflies. If aphid densities are very high on a small number of plants, the best strategy is often to discard the heavily infested plants entirely and use biological or chemical control to manage any remaining small populations. In North America, there are currently a number of commercially available biological control agents for aphids. Parasitoids can do an excellent job of keeping aphid numbers down, but they are very specific about which species they control. Make sure you have the correct pest identification so you can select the right parasitoid for the job. Predators, on the other hand, are not picky and will be effective against all species of aphids, and some may also feed on other pests in your greenhouse as well. As with other pests, aphids could develop pesticide resistance. 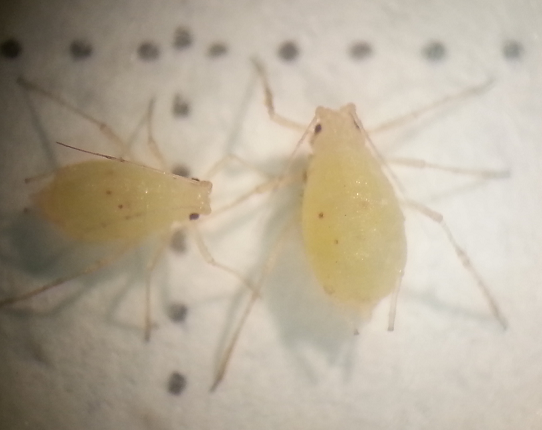 Melon and green peach aphids are well known to develop resistance to pesticides for some of their clones. Red morphs of the green peach aphid are sometimes associated with higher pesticide resistance, but this is not always the case. Caution should be used when making the decision whether or not to use pesticides in your crop. Judicious use of pesticides must be used in conjunction with a regular monitoring program, using action thresholds, rotating chemical classes, and at the same time, making use of all available control strategies. Foxglove aphid’s habit of hanging out under leaves at the soil surface make them more challenging to control with sprays where direct contact is necessary. While some aphids may be more susceptible to pesticides, so are the biocontrol agents used to keep your greenhouse clean. Before deciding to spray, consider the effects it will have not only the biocontrol agents that you are using against aphids, but also those that are controlling other pests such as thrips or whiteflies. If possible, consider using a biopesticide that will have a less negative impact on your biocontrol program. Discuss pesticide compatibility with your biocontrol supplier, or refer to the side effects manuals listed on the Koppert and Biobest websites. Jandricic, S.E., Filotas, M., Sanderson, J.P., and Wraight, S.P. 2014. 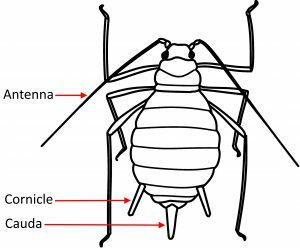 Pathogenicity of conidia-based preparations of entomopathogenic fungi against greenhouse pest aphids Myzus persicae, Aphis gossypii, and Aulacorthum solani (Hemiptera: Aphididae). Journal of Invertebrate Pathology, 118:34-46.